This machine is being replaced. It will be kept operational in the space for a few months to allow inducted members access to a 3D printer before they can arrange an induction on the new machine. 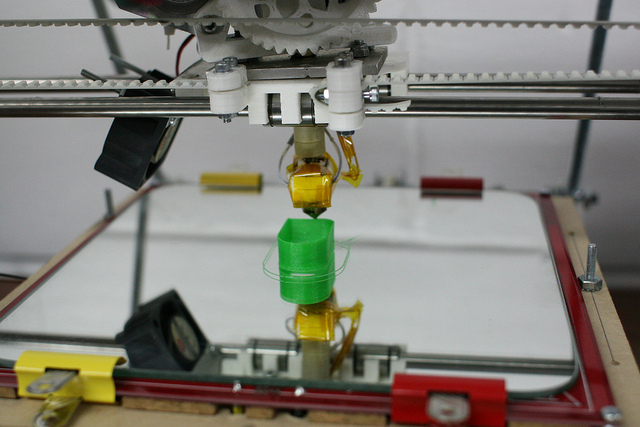 A RepRap 3D printer was donated to the hackspace by Steve Bullock in June 2012. It has been fixed and fettled and is finally producing good prints. Thanks go to those who have donated parts to get it going: a set of Sanguinololu electronics were donated by Doug, but unfortunately we could not get them working. We did use the stepper drivers, though. Matt V. donated an Arduino Mega 2560, Ian S. donated a set of RAMPS electronics. A heated bed PCB and SD card reader were donated by RepRapPro. A Reifsnyder Mk IV hot end was donated by the Thames Valley RepRap user group. Materials: PLA only. Please do not use ABS/PVA/HDPE/other random filament, as it may block the extruder. DO NOT USE IT WITHOUT AN INDUCTION! Currently, the inductors are Nick G, Ian A-S and Russell D. To arrange an induction, contact the inductors via the Bristol Hackspace Google Group. Inductions cost £10 per person, with the money going to the hackspace as a donation. Inductors volunteer their time to provide inductions and fit them around other commitments, so please be patient! Inductions are not scheduled on Thursday evenings, as it's the open evening; there's too much else going on to do an induction reliably. The Bristol Hackspace 3D printer training manual is available on Google Docs. You can produce files for 3D printing from many 3D programs. OpenSCAD, Blender, Sketchup are all open source programs you can use, or more commercial ones such as 3DMax, SolidWorks, AutoCad. The file type of choice is a .stl file, or stereolithography. It is a basic 3D model, with just the triangles and faces that make up a solid object. There are two parts to the printing process; taking the stl file to produce a sliced gcode file, and then sending that file to the printer. We use a program called Slic3r to slice the stl, and Pronterface (part of Printrun) to communicate with the printer. Ginger Ians Cheet Sheet for when prints go wrong. Check that there's nothing between the heated bed PCB and the glass; if the glass isn't in full contact with the PCB, you'll have problems getting it warm enough (I've seen this a few times with the printer). Check that the X axis is level. Best way is to measure between the top of the X end to the bottom of the motor mount, each side, and level it up. Check the bed is level with the nozzle. The easiest way to do this is to wind down the adjusters of the bed a couple of turns, home the Z axis, then adjust the bed to the nozzle at Z=0. Move the X and Y axes (by hand with motors turned of is usually easiest) so the nozzle is close to the three adjusters. Do the side with the two adjuster first (level in the Y axis), then the side with one adjuster (level in the X axis). Though you've replaced the Kapton, if you haven't cleaned it, your oily fingerprints will be all over it. Clean it with kitchen roll and Isopropyl Alcohol, or Acetone if IPA is not available. Make sure the teeth of the extruder are clean. Properly clean, with no chewed up filament in it. Temperatures - bed should be around 60C for PLA, and hot end can be anywhere between 175C and 220C - it just depends on the PLA. I'd start hotter (200-210C), then turn it down 5C at a time until it stops stringing. If it's old PLA, it just may not stick to the bed, or itself. Try different, preferably new, PLA. Persons not on this list may not carry out inductions. Friendly, constructive and relevant advice is encouraged. Contact for induction is via a request on the members forum. You may not use the 3D printer if you have not been inducted and are not on this list. Recommended supplier: Faberdashery are a local company, and sell consistent, high quality PLA, if a little on the expensive side. There is a long list of suppliers on the reprap.org wiki here. Caveat emptor. The RepRap, pretty much as we received it. When we received it, the X carriage end parts had all ripped out so they won't clamp onto the X rails properly. Ian printed a set of parts in white PLA, which have been fitted. At the same time, LM8UU bearings were fitted to each axis. When we experimented with printing ABS plastic, the x-carriage got a bit hot and deformed, and has since been reprinted. The reprap was supplied with an aluminium heated bed, which power resistors fitted to the bottom. It had no temperature controller, just used a laptop PSU running flat out. We persisted with this for some time, but ultimately it took too long to heat up and gave very inconsistent results. It was replaced by PCB heated bed, donated by RepRapPro, which is controlled by the RAMPS electronics, and is much more capable of higher temperatures. The original hot end worked, just, but caused problems by transferring too much heat into the extruder. A Reifsnyder Mk IV hot end has been donated by the Thames Valley RepRap User Group and has been fitted. The reprap originally came with mendel-parts generation 6 electronics. This has no heated bed controller, and has been replaced by an Arduino Mega 2560 and RAMPS motor shield (donated by Ian). We couldn't get the Sanguinololu electronics donated by Doug to work. An SD card reader, donated by RepRapPro, has also been fitted.